September 14 is RUOK? Day. The aim of this day is to reach out to people around you at home, work, school or elsewhere in your life to check if they are okay. Something as simple as this could make a difference in someone's life, providing them with the social support that helps them with depression or mental illness as well as preventing suicide. RUOK? Day was started by Gavin Larkin in 2009. In 1995 his father committed suicide and this had left him with over a decade of grief and questions. When working on documentary about suicide with Janina Nearn, they realised that more needs to be done. There are many people out there who are hurting that we could help, As a result, they created RUOK? Day to encourage all of us to simply start conversations with people around and find out how they are going. RUOK? 's goal is a world where we create meaningful connections with the people around us and have a mutually supportive social network. While suicide prevention is one aspect of this, there are many more benefits beyond that in terms of depression, mental illness and building a stronger society. Asking people if they are okay? Starting and conducting meaningful conversations with people who are suffering or struggling is not that hard, but a lot of people have no practice at it. RUOK? breaks down into 4 steps. 1. The first step is starting a conversation. Don't rush up to people and go RUOK? Instead, you can start with little things such as asking "How are you going?" "What has been happening lately?" or even a slightly more probing question such as "You have been quiet lately, is everything okay?" 2. The second stage is the hardest for most people, it is listening. People will talk if you stop to listen. That means sitting down with them, using open and attentive body language and avoiding being judgmental. Remember, listen more than talk and focusing on just acknowledging their problem. 3. You should encourage action, which doesn't mean just throwing advice at people, but it is more about helping them to find their own actions as well as asking what you can do to help them in their actions. After listening, you might provide some advice including, if they have been very depressed or stressed for more than a couple of weeks, recommend that they contact a mental health or health care professional. There are a number of hotlines you can contact or even websites like Reachout.com for people under 25. They can also visit their local GP who can put them in touch with mental health services. 4. Of course, you should always check back with them on a regular basis. Even just regular conversations or online messages can let them know that someone cares or is available when needed. These days it is so much easier to keep in contact with the people you know. The real gap for most people is having someone that they really feel that they can talk to about problems. As said before, that is someone who asks them how they are feeling and listens. You don't need to wait until September 14 to ask people if they are okay, instead, you can start the moment that you read this. You can also organise events and activities in your school, work or community. Unfortunately the websites for RUOK? Day doesn't have a list of events for the day. However, there are a number of things to look out for. 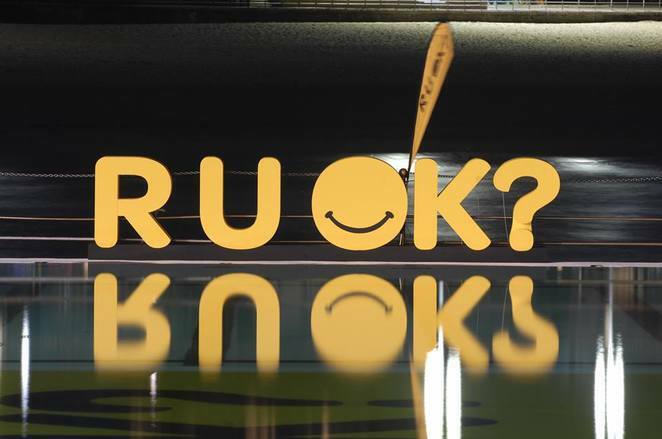 If you live in a rural community, keep an eye out for the RUOK? bus and conversation convoy. There are also a number of ongoing fundraisers that you can support. The simplest thing you can do is reach out to people around you on September 14, or for that matter, any day. Often the person you haven't heard from in a while is struggling or doing things tough. Not always of course, but if they are, you can make a difference in their life by a visit, phone call, text or social media message.